Hawaii, where Scalia was speaking, was one of the many states in which internment camps were established. Scalia invoked the Latin expression, “Inter arma enim silent leges” (roughly, in times of war the law is silent). “That’s what was going on—the panic about the war and the invasion of the Pacific and whatnot. That’s what happens. It was wrong, but I would not be surprised to see it happen again, in time of war. It’s no justification, but it is the reality,” he said. While Scalia’s remarks took the form of nominal disapproval of the Korematsucase and mass internments, his shoulder-shrugging at “the reality” of future mass internments should be taken as a serious warning. Since Scalia’s arrival on the Supreme Court in 1986, he has been a leading figure in the ongoing rollback of democratic and social rights. Some of the highlights of Scalia’s career include Stanford v. Kentucky (1989, upholding the death penalty for crimes committed by 16 and 17-year-olds), Bush v. Gore(2000, halting vote counting and installing George W. Bush as president), and Citizens United v. Federal Election Commission (2010, removing limitations on corporate spending during elections), among many others. Similar “exclusion orders” went into effect for Americans of German and Italian ancestry. 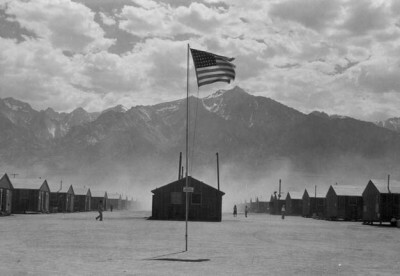 The Korematsu decision justifying mass internment has long been considered a shameful chapter in the Supreme Court’s history, forming part of the anti-canon of cases that includes Dred Scott v. Sandford (1857, defining slaves as property) and Plessy v. Ferguson (1896, upholding segregation). In 1988, none other than President Ronald Reagan signed an official apology for the internments, blaming what took place on “race prejudice, war hysteria, and a failure of political leadership.” Ultimately, approximately $1.6 billion was paid in reparations to the victims. With Western “social democracy” in free fall collapse in the first decades of the 21st century, and with world war again threatening from innumerable global flashpoints, it would be a mistake to write off Scalia’s remarks as the idle hypothesizing of an old reactionary. In the aftermath of the September 11, 2001 attacks, as many as 1,200 people were illegally rounded up and detained simply for being Arab or Muslim. The National Defense Authorization Act (NDAA) for Fiscal Year 2012 expressly gives the military the power to seize and imprison any person anywhere in the world, including within the US, on “terror” allegations—without charges, evidence, or trial. According to documents released by Edward Snowden, the US government is already using its mass spying apparatus to construct “political profiles” of individuals. Last year, the city of Boston was placed under military lockdown, with families ordered to “shelter in place” while armed commandos conducted house-to-house searches.